Both Tom and I are cradle Catholics. Both of our families were faithful and obedient to the Church. My father chose the U.S. Army as a career and so the family moved often and lived in various states and countries. While it was a good experience and educational; my brothers and I hadn’t the chance to attend Catholic Schools. However, my parents always made sure we were attending Catechism classes and involved in the Church. Tom was raised in a small town in Iowa and attended Catholic Schools through the 12th grade. We share this part of our life to give you a background on how both of our families were indeed committed to living the faith. I am the firstborn of three. My parents married when my mother was 18 after a lengthy courtship with my father. I was born in their first year of marriage. Well almost….my mother became quite ill during the pregnancy and almost lost the baby – me. She and her mother have a devotion to the Blessed Virgin Mary under the title of Our Lady of San Juan (Our Lady of St. John). In discovering that she may loose the baby; she and my grandmother made a “promise” a “promesa” (in Spanish) asking our Lady of San Juan’s intercession and consecrated the baby to her. Well, behold I was born! In my adult life, I became more attracted to Mary. One of my favorite prayers to Mary is called the Hail Mary. Eventually, Tom and I were attracted to a religious community founded in France in 1975 called the Congregation of St. John consisting of priests, brothers and sisters. We became Oblates of St. John (similar to a Third Order ). I don’t think it is coincidental that I become a member of this community. 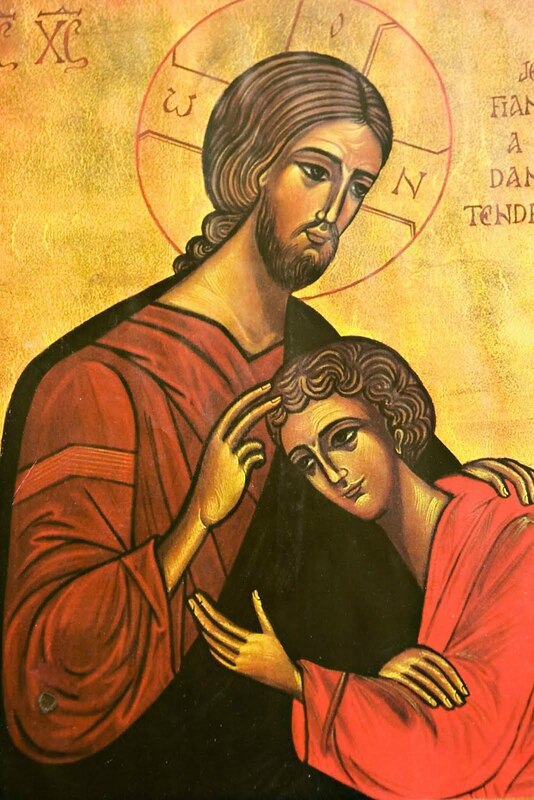 After all, they are named after their Spiritual Father – St. John the Evangelist. 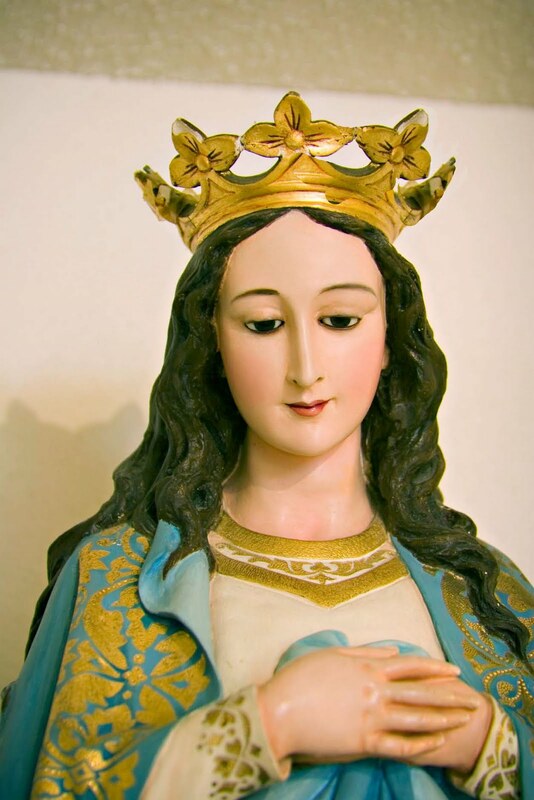 When my mother was pregnant with me, she had Uremic poisoning and received the Last Rites, however, I was born premature on Mother’s Day, May 13th, Feast of Our Lady of Fatima and then all was well with my mother. In my adult life I discovered the power of Mary’s intercession. My favorite prayer is the Memorare. By the way, Mary Jane and I discovered Mother Teresa’s ‘express novena’ – praying nine Memorare’s. At times we choose to pray this “express novena”, trusting in our Lady’s prayers, in the prayers of our Mother, the Mother of God. “Catholicism Live!” program on Catholic Television and Guadalupe Radio Network was on a woman from the Holy Land, born in Jerusalem, lived in Nazareth. She was a part of God’s plan of salvation and is known throughout the world, holding many titles. This woman is Mary, the Mother of God; mother of all humanity. The following are quotes used on the program and some that we didn’t have time to share. So here they are! They are beautiful, and can easily be taken to heart and can lead us to contemplate the gift from our Heavenly Father: Mary! “The Rosary when it is prayed in an authentic way, not mechanical and superficial but profoundly brings, in fact, peace and recnciliation. It contains within itself the healing power of the Most Holy name of Jesus, invoked with faith and love at the center of each “Hail Mary”. We invite you to watch a 9-part series on “Theotokos – Mary, Mother of God” on Catholic Television of San Antonio (CTSA), Channel 15 on Time Warner Cable beginning Wednesday, October 27th at 9pm. We were a part of this series with CTSA, as we lead a group of pilgrims to Lourdes, Fatima and Marian Shrines in Spain this Spring. This year, Lourdes celebrates its 150th year anniversary of Mary’s apparitions to Bernadette. Go to www.ctsa.tv and watch a 3 minute video introduction to the series. Soon, we will share with you how we encountered Mary! To Jesus through Mary! People Often Ask WHAT IS FAITH? It is for this reason that we profess the Creed together as a faith community. It is important to be aware of the fundamental truths that bind us together as Christians. If our Faith does not influence our decisions it is dead. If our faith does not inspire us to pray everyday and to worship God it is dead. The rich young man knelt before Jesus, knowing Jesus had words of eternal life, but when Jesus told him to give his possessions to the poor he went away sad because he trusted in his wealth more than in the invitation of Jesus. Jesus is inviting all of us to follow him, but to follow him faithfully we cannot love a person, place or thing more than him. It is in loving God above all else that we can reach our potential to love ourselves and to love others. God has a great plan for us, but He must be the most important part of the plan. It is impossible for us to be truly happy in this life and for all eternity relying on our own resources. The only way we can discover the generosity of God’s providence is by trusting in Him, even when it doesn’t reasonable. We found that spending time in prayer – in a Church, Chapel, a prayer room, your car – simply to take time out and think that Jesus is front of you listening to you can be a great start! Some of the greatest Saints known through the History of the Catholic Church started this way. Well…maybe not in the car…but they took that first step! Pete Remmert joined us on Catholicism Live Wednesday night to discuss his experiences and expertise regarding the Shroud of Turin, which is believed by many to be the actual burial cloth of Jesus Christ. If you’d like to see the Shroud of Turin for yourself, Catholicism Live hosts Deacon Tom & Mary Jane Fox are leading a special pilgrimage from San Antonio to see the Shroud April 25 – May 10, 2010. See the Shroud pilgrimage page on our website or call us at (210) 521-3377 for more details.